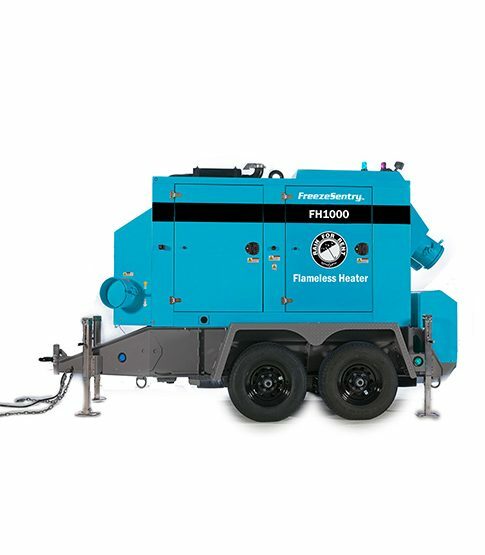 The FH1000 delivers up to 6,000 CFM at 6” Static Pressure allowing a continuous flow of heated air to travel long distances. Designed for ease of use, the FH1000 features automatic startup and shutdown upon key start. Engineered to be fuel efficient, the FH1000 has an automatic temperature control system to sense ambient temperatures and adjusts heating as needed. Proven anticipation software uses real time signals from four temperature sensors and makes the incremental adjustments as needed to deliver the required amount of heat. No overshoot, no wasted heat, and no deep-cycling during operation. One-switch key start and stop allows for operator to turn off the unit and leave without waiting around for unit to shutdown. Automatic engine over-speed protection ensures safe operation. Two roof mounted external floodlights and two internal cabinet work lights provide your workspace with needed light. Advanced digital display keeps you up to date on the flameless heater operating statistics. On-board storage for two 12” x 25’ flexible ducts. Easy read display in both day and night environments. Weight without fuel: 6,450 lbs. Heat transfer fluid: SyntheticATF 20 gal.